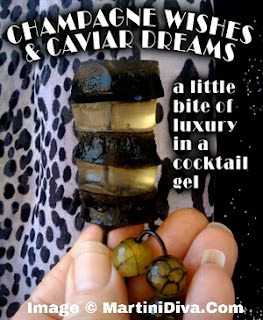 This CHAMPAGNE AND CAVIAR EDIBLE COCKTAIL GEL was inspired by the 1980's Robin Leach program "Lifestyles of the Rich and Famous" where he always signed off with the catchphrase "Champagne Wishes and Caviar Dreams". It was program filled with the uber-wealthy and the excesses of the filthy rich. Yes, the eighties were a decade of decadence and flash and "greed is good". Greed is not so good and decadence is reserved for a very lucky few these days, but that's no reason not to visit luxury every once in a while. These little savory bites of Champagne infused caviar can transport you to a lifestyle of the rich and famous, if only for a short period of time. Both Champagne and caviar can be bought in a wide range of prices but in this case I used American Sturgeon Caviar which retails at about $60 an ounce and a nice bottle of Iron Horse Brut which ran me about $40. Keep in mind that the Iron Horse is not technically a Champagne as it is not from the Champagne region of France, but it is a lovely sparkling wine that pairs very well with caviar. It's nice to go with higher end caviar if you have the funds, but stay away from the bargain basement varieties. 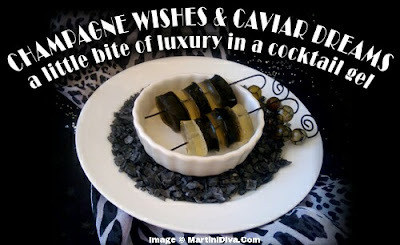 If you can't afford at least a medium quality Champagne and caviar then you aren't going to be enjoying anything close to "Champagne Wishes and Caviar Dreams" in your edible cocktail gel. I like to serve these with a flute of the Champagne and a side plate of blinis topped with some creme fraiche and more caviar. 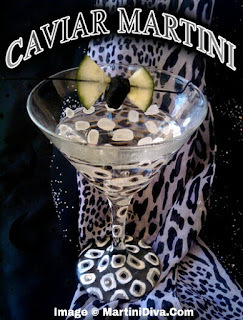 I also have a drinkable Caviar Martini just in case you'd rather lift a martini glass. CHAMPAGNE & CAVIAR COCKTAIL GEL DIRECTIONS These directions work for both the caviar layer and the Champagne layer, which you will do separately. Do one layer at a time so the Champagne doesn't go flat while you're waiting for the other layer to set! Spray all your molds with cooking spray and set aside. Put the caviar/Champagne or the cup of Champagne in a small mixing bowl and set aside. In a small microwaveable bowl, add the gelatin powder to 2 tablespoons of water. Give this a quick stir and allow to sit for a couple of minutes. Warm this mixture in the microwave for about 25 seconds or so, long enough for the gelatin to completely dissolve, then stir well. Pour the gelatin water into the caviar/champagne (or the champagne) and stir well until the gelatin is completely incorporated in. You can now pour this into your (sprayed) mold or a small pan and place in the fridge to set up. It takes a good hour minimum but 2 hours or longer is better. Once both layers are set you can then pop the gels out of your candy molds or cut out your shapes with the mini cookie cutter and layer them onto your cocktail pick for serving. GENERAL SPECIAL INSTRUCTIONS & TIPS If you find the cocktail gel a little too gummy candy in texture, you can decrease the gelatin packets to only 1 package instead of 1 and 1/2. Most cocktail gels can be frozen, depending on the ingredients however due to the delicate caviar I do not recommend freezing this cocktail gel. National Caviar Day is July18th.